Kieran Tierney should feature for Celtic before the end of the season but fellow defender Dedryck Boyata has all but played his last game for the Hoops, interim boss Neil Lennon has said. The defensive duo both limped out of Sunday’s 2-1 win over Rangers and were absent from the matchday squad named to face St Mirren at the Simple Digital Arena in Paisley. Speaking to BBC Sportsound ahead of the match, Lennon laughed off claims Tierney would be sidelined for the remainder of the season, insisting that while he would get an extended rest, he would play again before the end of the campaign. The 21-year-old returned to action in February after a ten-week lay-off with a hip injury, but a calf issue forced him to miss Scotland’s Euro 2020 qualifiers in Kazakhstan and San Marino. Tierney trained with the Celtic first team squad earlier this week, and was expected to line up against St Mirren, but Lennon is keen that Tierney is given as much time off as possible between now and the start of next season, raising the prospect of him not being available for Scotland’s Group I games against Cyprus at Hampden on 8 June and Belgium in Brussels three days later. 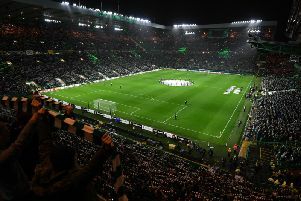 The Belgian international is out of contract in the summer but has shown no indication of signing a new deal at Parkhead.